(NaturalNews) If you're seeking an uncomplicated way to cultivate health, look to the lymphatic system. Working in tandem with the cardiovascular system, lymph fluids help remove toxins from the blood, while also transporting immune system cells. Since the lymphatic system doesn't have an organ like the heart to circulate fluid, it needs to be stimulated. Have a look below for several suggestions on how to do this easily each day. Drink plenty of water - Since hydration plays a key role in both circulatory systems, it's crucial to consume adequate fluids throughout the day. When we don't pay attention to this one basic practice, stress is placed on the lymph system, leading to inefficiency and toxic build-up. An additional benefit of proper hydration: the kidneys are able to do their job of flushing out water soluble waste. Dry skin brushing - Another simple habit that keeps the lymphatic system in top form is brushing the skin. Amazingly, there are hundreds of miles of lymphatic tubules in the body that collect waste products. When we brush the skin, the system is stimulated in a process called lymphatic drainage. To include this method in your daily routine, first you will need a high quality skin brush with natural bristles -- aim for one with a long handle so that you can reach the back and other inconvenient spots. Before your morning shower and after work are two good times to dry brush. Use short strokes toward the heart with firm pressure, but do not "scrub." Steer clear of delicate areas such as the face. Brush as long as you would like, although average sessions usually last between two and 20 minutes. Hydrotherapy - For a quick circulatory boost, try alternating hot and cold water during your shower. When the skin is exposed to cold water, the whole body contracts, which squeezes lymphatic fluid up. And when hot water is applied, fluid moves downward as the constriction relaxes. A good standard is to alternate water temperature every thirty seconds for the entire length of your shower. Just make sure you have a reliable shower filter to avoid absorbing more toxins than you're eliminating. Rebounding - One of the best ways to improve lymphatic movement and drainage is to bounce on a small trampoline called a rebounder. Utilizing gravity and non-impact motion, bouncing assists the flow of lymph fluid. One method is the "health bounce." Stand with feet shoulder width apart. Keeping your feet on the mat, bounce with a gentle up and down motion. That's all there is to it. 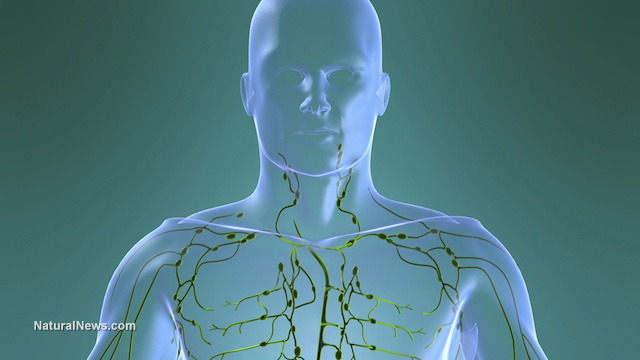 With just a few minutes a day, the lymphatic system is kept healthy and flowing. Lymphatic drainage therapy - Using a specialized technique that applies pressure to lymph nodes and tubules, a trained therapist can strengthen lymphatic efficiency. The method entails holding the hands flat and moving them in a wavelike motion on the body to release blockages and enhance circulation. The benefits include detoxification, relaxation, regeneration of tissue and a reduction of inflammation.